The new tricks for the ubiquitin/proteasome system are coming thick and fast these days. Hot on the heels of the discovery of non-lysine ubiquitination and thymus-specific proteasome subunits, today’s issue of Nature reports that there’s a second E1! That may not be as startling to everyone as it is to me, but it’s yet another example of well-established observations being overturned. Ubiquitin is attached to its substrate proteins through a multi-enzyme cascade. First, ubiquitin is “activated” by a ubiquitin-activating enzyme; then the ubiquitin is transferred to a ubiquitin-conjugating enzyme which, in combination with a ubiquitin ligase, transfers the ubiquitin to a specific substrate. The ubiquitinated substrate then does whatever its supposed to do when it’s ubiquitinated — gets degraded by the proteasome, perhaps, or trundles off to a new spot in the cell. The ubiquitin ligase (an “E3” enzyme) is mainly responsible for the specificity of the reaction; there are thousands of ubiquitin ligases in the human genome, and probably each interacts with a small number of specific substrates. Ubiquitin conjugating enzymes, the second in the chain (“E2” enzymes) are less abundant and less specific; there are a couple dozen of them. Each UBC interacts with a number of ubiquitin ligases, though the relationships here are not well understood in general. The first link in the chain is the ubiquitin activating enzyme, the E1 (the gene in humans is “Ube1”). There’s only one of them — say all the reviews.1 If you knock out the single E1, as in some temperature-sensitive cell lines, then the cells die in a hurry. 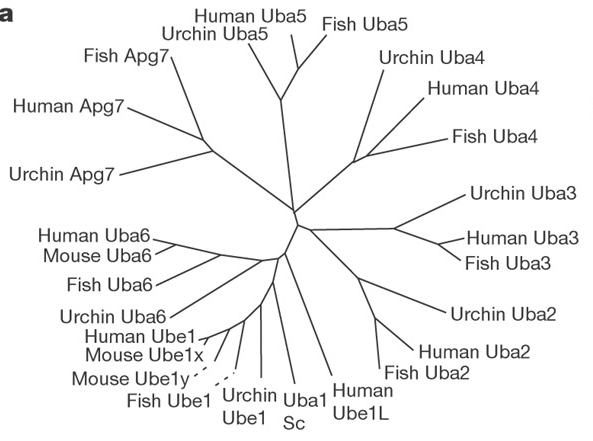 This is a gene called “Uba6”, it has the three domains that Ube1 does, it’s about 40% identical to Ube1, and it’s found in vertebrates and sea urchins but not invertebrates or fungi (both of which do, of course, have their own versons of Ube1). (Figure on the right is from the paper, showing the relationships between some E1-related genes of various species; note that the Uba6 genes are most closely related to Ube1 genes even from different species). Uba6 is found throughout the body (so unlike the mouse thestis-specific version of E1, it’s not tissue-specific), though at much lower levels than E1 Classic. It acts like an authentic E1, in that it charges ubiquitin, but (and this is a cool and critical point) it seems to be specific for different ubiquitin-conjugating enzymes; two of the three UBCs they tested were strictly dependent on Ube1, while the third was strictly dependent on Uba6. It’s not merely a redundant, backup E1. What are the implications? Once again there’s a technical point: The authors point out that “it is conceivable that certain pathways that were previously thought to be independent of ubiquitin on this basis may nevertheless require ubiquitin by means of a Uba6-dependent pathway.” But the bigger question is why vertebrates need two E1s, where invertebrates get along fine with just one.2 The authors propose (a little feebly, I think) that this may allow differential regulation: “One possibility is that Uba6 and Ube1 are differentially regulated by upstream signalling pathways to enhance flux through a specific conjugating pathway under particular circumstances.” That’s a pretty vague suggestion that covers a host of possibilities. Still, being able to tease apart different pathways should be a very useful way of tracking down their function, and also may help actually understand what some of the different UBCs are doing. Might this be a way to organize some of the myriad ubiquitin functions? Could Uba6 lead to a different set of ubiquitin reactions — say, trafficking instead of degradation? I haven’t read both papers carefully enough to judge the relative merits, but what I like about the JBC paper is that they keep the original name UBE1L2 for the gene instead of inventing a new one. The gene by itself is known for a long time, also that it will work as an E1. What is new is that this E1 acts on ubiquitin instead of another UBL protein, as everybody had expected. After all, there are several ubiquitin-like modifiers out there that still lack an E1. On the other hand, the E2 specificity is clearly a point in favour of the Harper-paper.